A new distance to love – the 8K! When I signed up for the Gasparilla 15k/8k challenge, I knew that I would be encountering a distance I have yet to run as a timed event – the 8k! 4.97 miles to be exact 🙂 Having completed a 15k the day before, I was happy with my finish time of 59:01. A great distance for sure. I always feel like I’m just getting in the groove when I get close to the end of a 5k and I’m not yet able to maintain a fast pace for a 15k or longer. The 5 mi distance of the 8k was great! I will certainly run it again in the future! I know only have one more heart to put on my car decal from Nanci! 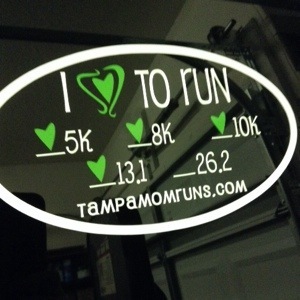 Spacecoast marathon in late November of this year will complete the full decal!